Pythagoras first proposed that the Earth was round sometime around 500 B.C. He based his idea on the fact that he showed the Moon must be round by observing the shape of the terminator (the line between the part of the Moon in light and the part of the Moon in the dark) as it moved through its orbital cycle. Pythagoras reasoned that if the Moon was round, then the Earth must be round as well. After that, sometime between 500 B.C. and 430 B.C., a fellow called Anaxagoras determined the true cause of solar and lunar eclipses – and then the shape of the Earth’s shadow on the Moon during a lunar eclipse was also used as evidence that the Earth was round. Eratosthenes of Cyrene 276 BC– c. 195 BC was a Greek mathematician, elegiac poet, athlete, geographer, and astronomer. He made several discoveries and inventions including a system of latitude and longitude. He was the first Greek to calculate the circumference of the earth (with remarkable accuracy), and the tilt of the earth’s axis (also with remarkable accuracy); he may also have accurately calculated the distance from the earth to the sun and invented the leap day. He also created a map of the world based on the available geographical knowledge of the era. In addition, Eratosthenes was the founder of scientific chronology. Eratosthenes measured the circumference of the earth without leaving Egypt. 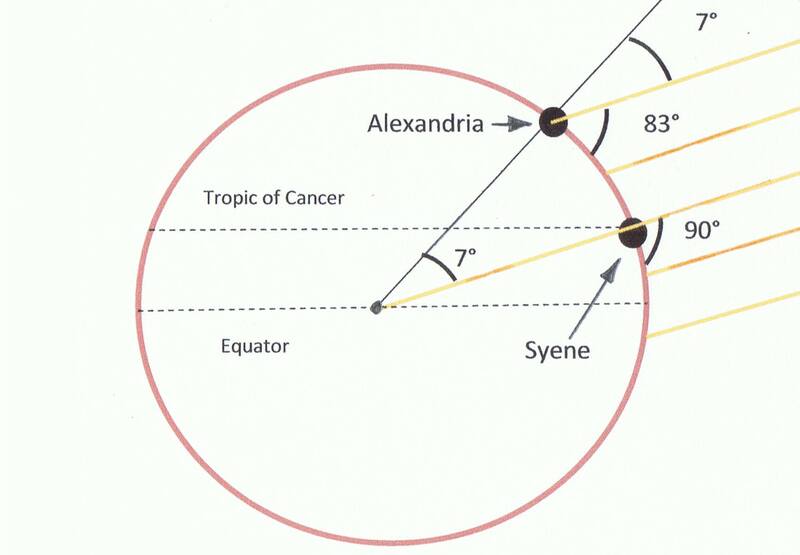 Eratosthenes knew that on the summer solstice at local noon in the Ancient Egyptian city of Swenet (known in Greek as Syene, and in the modern day as Aswan) on the Tropic of Cancer, the sun would appear at the zenith, directly overhead. He also knew, from measurement, that in his hometown of Alexandria, the angle of elevation of the sun would be 1/50 of a full circle (7°12′) south of the zenith at the same time. Assuming that Alexandria was due north of Syene he concluded that the distance from Alexandria to Syene must be 1/50 of the total circumference of the earth. His estimated distance between the cities was 5000 stadia (about 500 geographical miles or 800 km) by estimating the time that he had taken to travel from Syene to Alexandria by camel. He rounded the result to a final value of 700 stadia per degree, which implies a circumference of 252,000 stadia. The exact size of the stadion he used is frequently argued. The common Attic stadium was about 185 m, which would imply a circumference of 46,620 km, i.e. 16.3% too large. However, if we assume that Eratosthenes used the “Egyptian stadium” of about 157.5 m, his measurement turns out to be 39,690 km, an error of less than 1%. Eratosthenes measured, at his local noon in Alexandria, the angle of elevation of the sun on the summer solstice (21 June). Eratosthenes used the local noon and no other time of the day since at local noon all relevant places and sunrays are placed on the same imaginary plane enabling the use of simple geometry for his calculations. In order to repeat Eratosthenes’ experiment you’ll have to do the same. First, calculate your local noon because it may be quite different from 12:00 noon on the clock. There are several ways to compute its exact occurrence. Basically, local noon is half-way between sunrise and sunset. You can obtain sunrise and sunset times, for June 21, from your local paper or from this link: http://aa.usno.navy.mil/data/docs/RS_OneDay.php which also calculates local noon (sun transit). You can also obtain it by yourself by using a sundial or find out when the shadow is the shortest around noon time. On June 21 erect a vertical straight stick or pole of about 1 meter using a carpenter’s level and measure the length of the shadow it casts at your local noon. With simple trigonometry you can obtain the angle of the elevation of the sun. You can also obtain the angle, without trigonometry, by drawing the stick and shadow proportionally and measuring it with a protractor. You can compare your results with a web based applet like this: http://www.jgiesen.de/azimuth but be careful to use it correctly (insert your correct time zone, local noon, coordinates, date and ensure that the dropdown menu points to elevation). 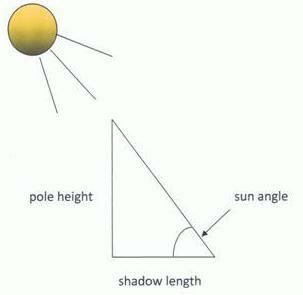 After you get the angle of sun elevation, it’s very easy to calculate the zenith angle by subtracting it from 90°, like Eratosthenes did. Now you’ll have to measure the distance from your location to the Tropic of Cancer altitude line – not by camel caravans of course, the Eratosthenes way. You can use a relatively large scale map, but take in account that maps tend to distort distance and the best option is to use a globe. The distance from your location to the Tropic of Cancer should be measured from north to south. In other words the distance line has to cut the Tropic of Cancer at a right angle. There are also web based calculators for this: http://facstaff.gpc.edu/~pgore/ISCI/earthcircumference.html. Likewise, you can also perform this experiment on the winter solstice that takes place around 21 December, but you’ll have to measure your distance from the Tropic of Capricorn instead from the Tropic of Cancer because on this date the sun reaches its highest degree of elevation on the Tropic of Capricorn (23° 26′ 22″ south of the Equator). It is also possible to perform this experiment on the two Equinoxes which occur on 20 March and 23 September each year when the sun is crossing the equator at the local noon on those dates and the sun rays are just overhead the equator at a right angle to the ground. But instead to measure your distance from the Tropic of Cancer or the Tropic of Capricorn you’ll have to measure it from the equator. There is another option and you can perform this experiment on any other date of the year, at local noon time, but you should have some partner located on your longitude willing to measure sun elevation at the same time. Take in account that you’ll have to be a little careful treating correctly the sun angles obtained in this case. At any date the sun reaches its highest position, at noon time, at some altitude. From here is clear that if the two places involved are located on the same side of this altitude (north or south) the shadows will be casted at the same direction and the obtained angles should be subtracted from each other, whereas if the places are located on different sides of this altitude the shadows will be casted at different direction (southward or northward) and the angles should be added up. Join the greatest religion in Universe, fight the War on Moron and rid the world of Ignorance. Trace the footsteps of the greatest minds that ever lived, on the eternal road of infinite study. Achieve spiritual perfection and experience oneness with Universe by becoming Sage. Realize the greatest secret of all.. It cannot be destroyed ! Accept the Sacred Facts today and be saved from the works of Moron.